Dr. Sam Selva has worked at Westport Animal Hospital since 2010. He grew up in the United Kingdom. Dr. Sam received his D.V.M. degree from the University of Queensland in Brisbane, Australia. He has extensive training with small animals, reptiles, fish, birds, equines, and exotic animals. 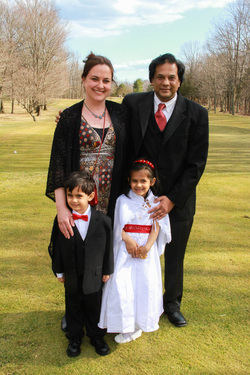 Dr. Sam is married to Gitta Selva who is a graduate of New York University. They have two young children - Skye and Ethan (see photo below). Above is a photo of their 3-year old cat, Tinkerbell. Gitta found her as a kitten with 3 broken legs. Dr. Sam mended the broken bones, and the Selvas decided to adopt her. Dr. Rocco Frank opened Westport Animal Hospital in 1982. Since fall 2014, Dr. Frank serves as a consultant.